If you’ve used the Recent Files menu to attach files to email messages in Mail.app, you may have noticed a big problem afterwards. Default Folder X would start ignoring requests to switch to other folders – no matter what you selected from the Favorites or Recent Folders menus, the file dialog wouldn’t go where you asked it to. Anyway, choose “Check for Updates” in your current copy of Default Folder X to have it download the new version, or hop over to the Default Folder X release page for details and download links. Version 5.2.3 of Default Folder X is available. After many requests from users and a bunch of back and forth with Mudi at BinaryNights, the developer of ForkLift, I’m happy to announce that we’ve got Default Folder X and ForkLift working together! Default Folder X’s “Finder-click” feature now supports ForkLift (version 3.2.2 or higher). If you’ve got a ForkLift window open on your Desktop, clicking on it while a file dialog is frontmost will switch the file dialog so it shows the contents of the folder in the ForkLift window. And if you want to switch to one of the folders open in another tab of that ForkLift window, Control-click on the window to get a menu of folders in other tabs. Also, if you select a folder or file from Default Folder X’s menu in your menubar when a file dialog isn’t frontmost, that file or folder will be opened in ForkLift if it’s running. If you haven’t tried ForkLift yet, hop over to BinaryNights‘ website and download a copy. 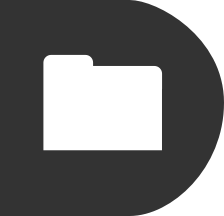 It’s a great alternative to the Finder, as well as for viewing and manipulating remote files on FTP, WebDAV, Amazon S3, Google Drive and other servers. An enhancement that you probably won’t notice but that makes a big day-to-day difference is a revamping of the code that switches from one folder to another in Open and Save dialogs. I sat down and reconsidered the underlying mechanism, and as a result made it faster, more efficient and more reliable. This also eliminated compatibility issues with Magnet and BetterTouchTool, so it’s a win all around. There are also bug fixes based on crash logs that have been submitted (yes, I do look at them!) and tech support emails that folks have sent. I got rid of some ugliness in the Folders tab of Default Folder X’s preference window, added AppleScript commands to access recent Finder windows, and enhanced a number of features in little ways. The official change log is on the Default Folder X release page, along with links to download version 5.2.3. Before starting a reorganization and rewrite of Jettison’s internals, I figured I’d better officially release the myriad little changes that I’ve been trickling out to various folks as they’ve contacted me with issues. Version 1.6 brings Jettison up-to-date with APFS (the new file system format released in High Sierra) as well as making its drive mounting / remounting procedure more robust. There are also a bunch of bug fixes and improvements in error checking and error reporting, and new AppleScript commands for ejecting, remounting and sleeping. You can grab the update from the Jettison Release Page, as well as seeing a more complete list of changes there. So I’m continuing to chase down that issue, as well as a rare one where the machine continually cycles between sleep and wake states every few seconds, resulting in hundreds of “External disks ejected” notifications from Jettison while the machine was supposed to be sleeping. This situation is rare and I’ve been unable to reproduce it here, making it a tough one to figure out. If it’s happening to you, please let me know at support@stclairsoft.com. 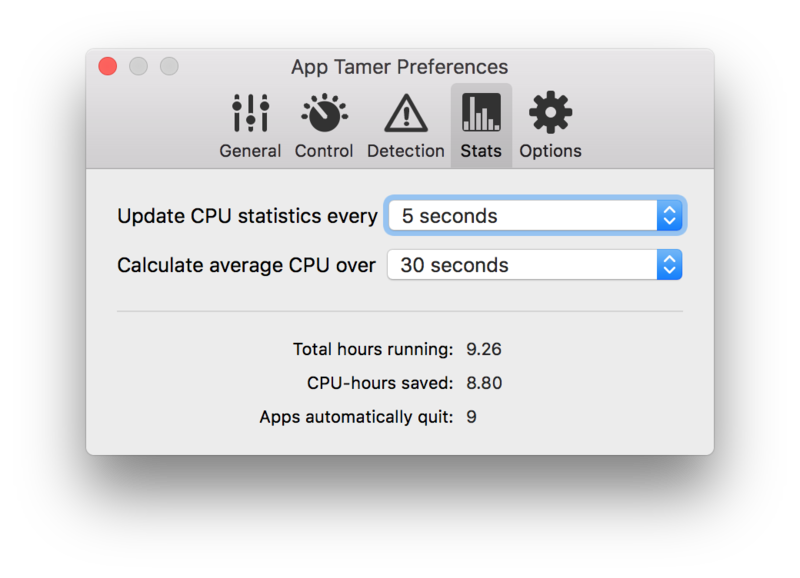 Version 2.3.5 of App Tamer is available, bringing several improvements and fixes on the performance side, as well as showing you how much CPU time it has saved. Other changes include fixing a memory leak that would cause App Tamer to gradually use more and more RAM if left running for long periods of time, fixing some UI glitches and improving VoiceOver support. Grab a copy of App Tamer 2.3.5 from the App Tamer Release page, or by selecting “Check for Updates” from its menu if you’re already running it. I’m happy to announce that version 5.2.2 of Default Folder X is available. It fixes several issues, including a bug that could cause Default Folder X to leave Save dialogs stuck on screen indefinitely. Compatibility issues with Keyboard Maestro, LaunchBar and InDesign have also been addressed, and there are a few new AppleScript verbs available for those of you that are using Default Folder X as part of a larger automated workflow. What I’m most pleased with, however, is managing to significantly cut Default Folder X’s “reaction time” – the time it takes from a file dialog appearing until Default Folder X’s controls pop up next to it. It’s been reduced by more than half through intelligent caching and streamlining of the dialog detection code. Default Folder X is faster in other operations too, but that initial delay was the most annoying thing, especially because it had actually gotten slower in High Sierra. To use something besides ForkLift, substitute the app’s bundle identifier for “com.binarynights.ForkLift-3” in the command above. Please be aware that this may cause other applications to also use that app as the default file viewer / manager, so your mileage may vary depending on how you want things to work. And in other ForkLift news, I’m working with Mudi over at Binary Nights to integrate Default Folder X and ForkLift more closely. Default Folder X’s Finder-click feature will work with ForkLift in the near future. Anyway, enough rambling – go get Default Folder X 5.2.2! If you’re already running Default Folder X, just select “Check for Updates…” from its menu in your menubar. If not, go to https://www.stclairsoft.com/DefaultFolderX/index.html and hit the “Download” button. Oh, and if you want to see the full list of changes, check the Default Folder X Release page. Version 2.3.4 of App Tamer is now available, adding an extra checkbox to the settings for each application. You can now have App Tamer automatically quit an app after it’s been unused for a certain amount of time – handy for those one-shot utilities like password managers, image converters, Contacts, etc that you look at quickly and then accidentally leave open. 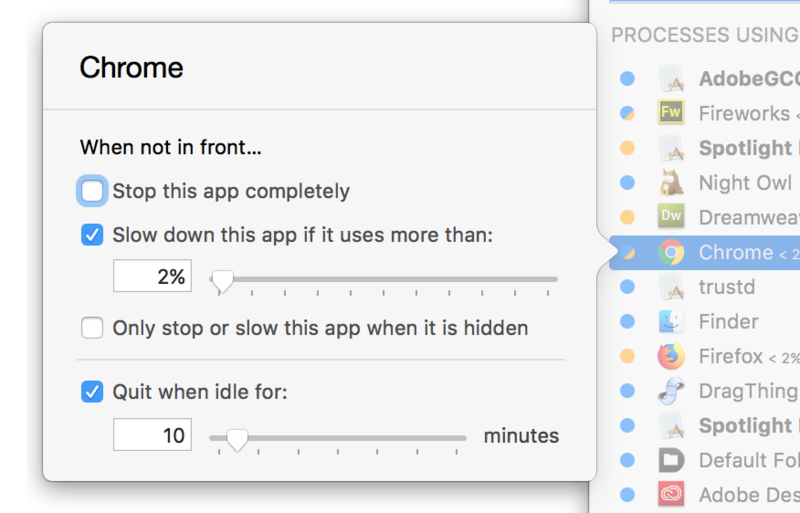 This version also improves App Tamer’s ability to control the CPU usage of applications that employ helper processes to do some of their work. This includes web browsers, Spotlight, virus scanners and backup utilities, among other apps. While App Tamer’s management of CPU usage is always going to be approximate (because it doesn’t know the inner workings of every app), it now keeps an app’s average usage much closer to the limit you’ve specified. Head over to the App Tamer release page to see the full list of changes and to download a copy of version 2.3.4! Default Folder X 5.2.1 is available now. It provides a single fix which corrects problems that Default Folder X 5.2 had when setting Spotlight tags and Finder comments specified in a Save As dialog. The Details: I got a little overzealous with memory cleanup, which resulted in the tag- and comment-setting tasks deleting themselves as soon as they were created. They never got a chance to actually do their jobs – how unfair! My apologies for the back-to-back updates, and not catching this before release. “Hey, why isn’t this reference marked as ‘weak’ inside this block? I’ll just fix that before I finalize the build – it’s an obvious goof, and what could go wrong?” Right, Jon. Default Folder X 5.2 is also back in step with Apple’s iCloud Drive ruse. Even though your Desktop and Documents folders aren’t really in your iCloud Drive folder, Default Folder X will pretend they are by showing them there in its menus. And yes, it understands what to do if you turn “Desktop and Documents” off in your iCloud settings, which then actually does put them in your iCloud Drive folder, along with separate Desktop and Documents folders in your Home folder (no, that’s not confusing). And if you’re running High Sierra, you may have noticed that Default Folder X stopped showing any iCloud items in its Recent Files and Recent Folders menus recently. That’s because Apple has once again hidden your Library folder, and iCloud stuff is actually stashed inside it. Prior to version 5.2, Default Folder X wouldn’t show items in hidden folders because, well, you might not want everyone to see all your hidden stuff, right? Well, now ~/Library/Mobile Documents/ (aka iCloud) is treated specially so that Default Folder X is once again useful in getting to your recently used files and folders, even when they’re on iCloud. There are also user-experience improvements in 5.2, namely the process of authorizing Default Folder X in the Security & Privacy settings in System Preferences, and the way Default Folder X handles Gatekeeper Path Randomization if you download and launch it in place. And as a bonus, your license information will no longer be randomly forgotten when a bug in macOS stops giving Default Folder X information from its own preference file. My apologies to anyone that’s gotten bitten by that in the past. Finally, updating will also net you a more capable Compress command, a handful of fixes for bugs, memory leaks and such, and some prettier icons in Default Folder X’s menus. If you’re already running Default Folder X, just choose “Check for Updates” from its menu – or run over to the Default Folder X release page to download a copy to install manually. High Sierra corrupting application preferences? Prior to El Capitan, I used to sporadically see a few ‘random’ but consistently-repeating tech support issues. The most common were settings not “sticking”, file dialog windows not remembering their sizes, and St. Clair Software applications forgetting that a user had purchased a license. 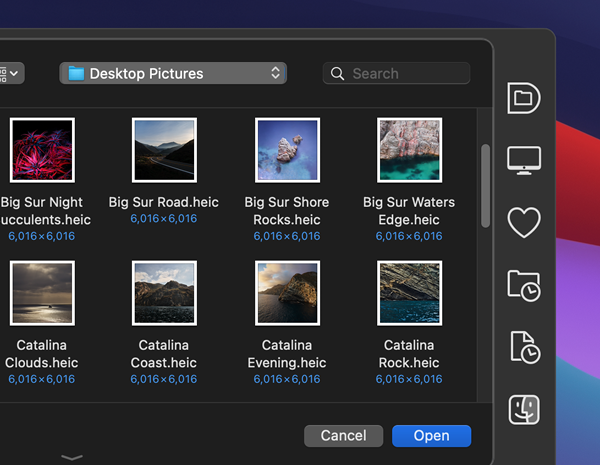 You might say “how are these in any way related?” Well, they all involve data stored using NSUserDefaults or CFPreferences, the built-in preference storage for macOS applications. It appeared that preference files would occasionally get corrupted – most commonly when an application auto-updated or when the user installed a macOS system update. The result was software not being able to retrieve previously-saved information. The incidents would often happen in waves – just after Apple released an OS update, or just after I released an update for one of my products (most noticeably Default Folder X, since it has the largest user base). After Apple released El Capitan, most of this went away. I knew they’d been working on the application preference system for El Capitan because, in a few of the early developer betas, it was partially broken or changed in interesting ways. But by the release of 10.11.0, everything was working better than it ever had. Hooray for progress! Right? And then came High Sierra. After two fairly quiet years, the preference-file-related problems started popping up again with increasing frequency. The most recent Default Folder X release seems to have resulted in a bunch of paid users being suddenly told they were running a trial version (the common thread is that they’re all running High Sierra). If you’ve been affected by this, I’m sorry! Unfortunately, nothing in Default Folder X’s license handling code has changed, it just suddenly can’t read your license information from its preference file, forcing you to re-enter it. I’ll be changing how Default Folder X saves its license info in future versions so this doesn’t keep happening because, yes, it’s really annoying. With the apology done, I’m wondering – if you’re a developer, have you noticed similar issues with High Sierra? I never dismiss the possibility that I’m just doing something stupid, but with NSUserDefaults, there’s really not a whole lot to do wrong (feel free to correct me, of course). This has only happened to a very small percentage of my users, but there is a 100% correlation between the problems and High Sierra.